I have a lot of readers who live outside the US so I thought they and others who don't read Bazaar might be interested to see the other Juicy abode. 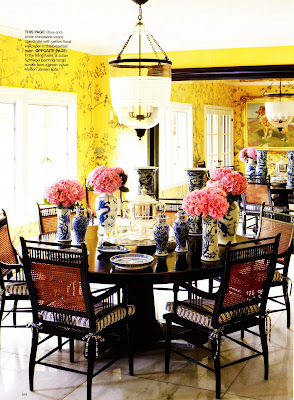 This one is a 1939 Georgian colonial in Beverly Hills that had more than a little help from interior designer Peter Dunham to pull it all together in a European style he calls "Duchess of Windsor meets Iron Maiden." Pamela Skaist-Levy are one lucky family. Both of the homes are different but are each are spectacular in their own way! 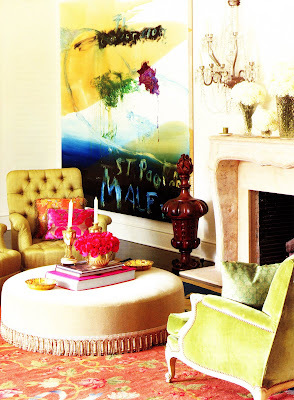 I especially love the green Jansen sofa mixed with the modern painting by Julian Schnabel! Tres chic! Click "Read More" to view more juicy stuff! 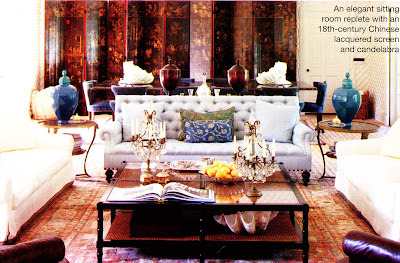 The sitting room has pops of blue that echo the beach house collections of glass but in this case they sit next to an 18th-century Chinese lacquered screen. The breakfast room is light and airy. I always think that pink flowers in blue and white Asian vases is a lovely contrast and very Anna of Absolutely Beautiful Things! 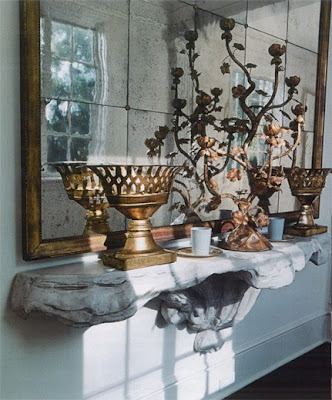 I'm obsessed with antique mirrors lately and this is an exceptionally beautiful one! The urns aren't too shabby either! 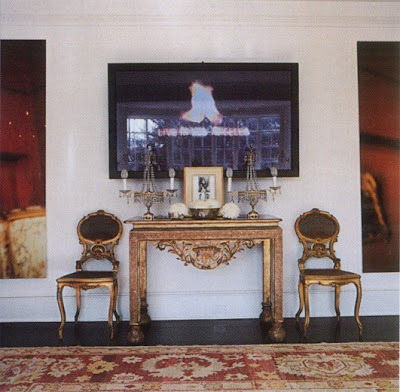 This is a much more expensive and ornate version of what I was going for at the Bachelor Pad! 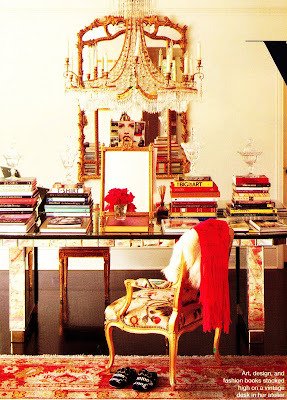 The vintage mirrored desk is to die for looks fabulous with the French chairs and art and design books! 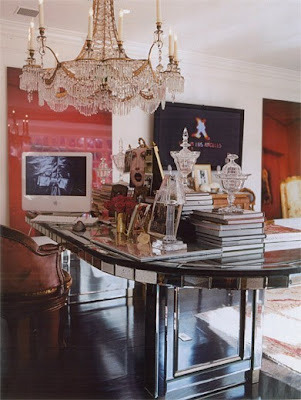 In this view from another magazine, they left the computer on the desk! 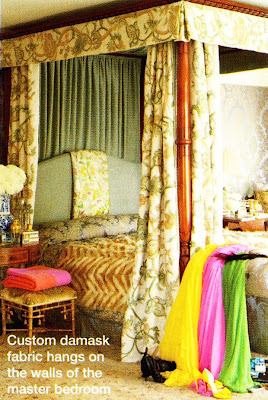 The bed came from Sotheby's in London but was rebuilt to accommodate a king size mattress. 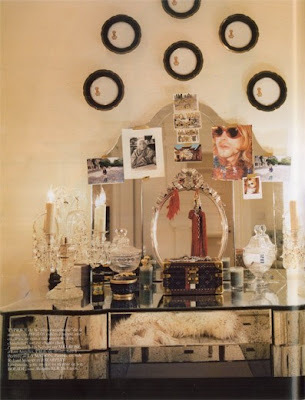 I think every woman should have a vanity! It makes getting ready for a party an experience to be an enjoyed! 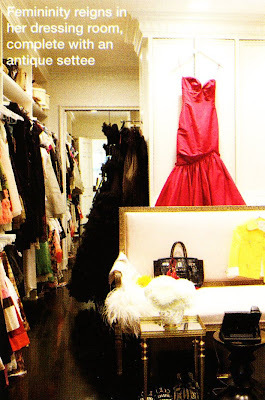 And of course the closet/dressing room wasn't forgotten. I love the antique settee and of course the Hermes bag. I guess those velor sweatsuits really did make a lot of money!